To Make Salsa: In a medium bowl, combine watermelon, cucumber, sweet pepper, corn, cilantro and onion. In a small bowl, mix together ¼ cup lime juice, honey, red pepper flakes and salt. Refrigerate for at least 1 hour before serving, to blend flavors. To Make Honey Lime Glaze: In a small bowl, mix together ¼ cup lime juice, 2 tablespoons honey and Tabasco. Add the honey lime glaze to the same pan. Cook for about 30 seconds until melted. Return cooked chicken to pan, flipping the chicken once to coat with the glaze. Remove from pan and plate each piece. 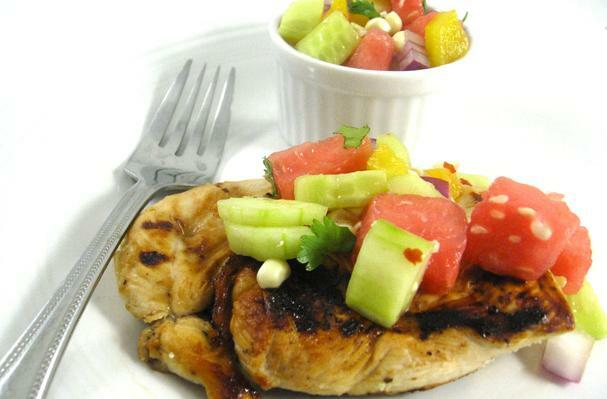 Spoon watermelon salsa on top of each piece of chicken and serve with more salsa on the side. Serve with our recipe for Simple Garlic Toast, if desired. Recipe follows. Start with 4 slices sourdough wheat bread. We bought ours at Trader Joe’s but most markets sell sourdough wheat bread or use regular sourdough slices. Cut each slice in half and toast all of them. Spread each half with 1 teaspoon reduced-fat butter or Smart Balance Light. Sprinkle each with a little garlic powder. Place all 8 halves on a plate and reheat in microwave for about 15 seconds. Our favorite garlic powder is Lawry’s with parsley. We’ve been buying it for years because it taste much better than most garlic powders. This recipe is a true gem…Truly fresh and refreshing! First, the chicken is so tender and flavorful. Marinating in fresh lime juice and seasonings really adds to its tenderness. In addition, we’re topping the cooked chicken with a tasty and simple to make honey lime glaze. Our summertime salsa is sweet, crunchy and mildly spicy. It too is marinated in a lively sauce. It’s so versatile and works as an amazing accompaniment to chicken, fish, or pork.